Since its publication in 1978, Edward Said’s Orientalism has been “the subject of countless conferences and impassioned debates. Perhaps more than any other work of late twentieth-century criticism, it has transformed the study of literature and culture” (Bayoumi 63). In the field of China studies, there have been some book-length studies directly inspired by Said’s work, including Chen Xiaomei’s Occidentalism: A Theory of Counter-Discourse in Post Mao China (1995), Bob Hodge and Kam Louie’s The Politics of Chinese Language and Culture: The Art of Reading Dragons (1998), Adrian Chan’s Orientalism in Sinology (2009) and most recently Daniel Vukovich’s China and Orientalism: Western Knowledge Production and the P.R.C. (2011). Although Ming Dong Gu’s Sinologism: An Alternative to Orientalism and Postcolonialism may be seen as another response to Said’s work, the book distinguishes itself from these other studies in two important ways. First, throughout the book, Gu reiterates his devotion to and admiration for “the noble pursuit of scholarship for its own sake.” Against the politically- and ideology-laden trend initiated by Said’s work and further developed in postcolonial studies, Gu claims that his “ultimate aim in proposing Sinologism is to find inspirations and insights for depoliticizing and de-ideologizing China scholarship” (65). Second, Gu’s book seems to gesture toward something exciting and unsettling that we might term “global sinology.” While Gu dedicates the book to his American mentor, literary scholar J. Hillis Miller, Gu’s own bio reads: “a Distinguished Guest Professor in the Institute for Advanced Studies of Humanities and Social Sciences at Nanjing University, China, and Professor of Comparative Literature at the University of Texas at Dallas, USA.” Does Gu see himself first as a guest professor in China? Or does this book have a greater affinity with China? For, if we read Gu’s acknowledgement carefully, we know that he first published the book as six articles in prestigious journals in China. A symposium titled “Sinologism: Theoretical Inquiry” in Nanjing in 2010 greatly helped Gu hone the book, which took shape at the Institute for Advanced Studies of Humanities and Social Sciences at Nanjing University, China. Clearly, Gu’s Sinologism is not just another US academic book written in English and targeting western and English-speaking readers. One therefore wonders in what ways the Chinese story behind his book has shaped his arguments and theoretical inquiry. Sinologism consists of an introduction, eight chapters, and a conclusion. The introduction, “Orientalism and beyond,” addresses the origin, objectives, and the thematic concerns of the book. According to Gu, although he originally inspired by Said’s work to launch a critique of Western ways of looking at China and misrepresentations of Chinese culture, the book eventually evolved into a critical inquiry of and self-conscious reflection on knowledge production about China both in the West and in China. The first three chapters lay the groundwork by investigating what Sinologism is and its relation to other concepts and theoretical issues. Chapter 1 explores the unconscious nature of Sinologism. Gu defines Sinologism as an alienated form of Sinology and China-West knowledge. It manifests as an implicit system of ideas, notions, theories, approaches, paradigms, first conceived and employed by the West in the encounter with China and then absorbed by non-Western people (including the Chinese). Gu argues that the inner logic of Sinologism is a “cultural unconscious” that led to pervasive distortions, misperceptions, and misrepresentations in the knowledge production about China both in the West and in China. Chapter 2 discusses Sinologism in relation to other key terms such as Sinology, Orientalism, postcolonialism, and sinologization. Gu’s analysis highlights the fundamental difference between Sinology and Oriental studies, thus Sinologism and Orientalism. 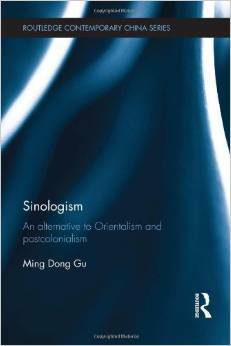 He argues that Sinology, as a branch of scholarship, is much less political and ideological than Orientalism. Gu believes that such “non-political and non-ideological tendencies” embodied by Sinology (and Sinologism) set it apart from highly politicized Orientalism and postcolonialism, and make Sinologism a potentially more constructive paradigm. Chapter 3 studies the historical development and various forms of Sinologism. For Gu, Sinologism is a global and multi-dimensional intellectual enterprise. It came into being as a result of Western efforts to bring China into a West-centered world and knowledge system. Gu’s examination focuses on leading Western philosophers such as Voltaire, Montesquieu, Herder, Hegel, Marx, and Weber and their endeavor to situate China within a grand narrative of universal history. He then turns to another romantic dimension of Sinologism marked by the idealization and mystification of China. Marco Polo, Goethe, Bertrand Russell, Fenollosa, and Pound are some of the names mentioned in this discussion. According to Gu, after the coming of the West to China, Sinologism took on a Chinese dimension. The blind acceptance of Western ideas and paradigms, the conscious admission of Western superiority and Chinese inferiority by Chinese intellectuals since the early twentieth century created a distinctive branch of Chinese Sinologism. Finally, Gu’s discussion turns to the non-Western dimensions of Sinologism. Citing a well-known Japanese scholar who points out that “up to the present and especially in modern times, it is a common practice to view China from the perspective of Europe,” Gu argues that non-Western people tend to look at China from the Western perspective and therefore unwittingly exercise their own forms of Sinologism. Chapters 4 and 5 examine the problematic epistemology and methodology of Sinologism. In Chapter 4, Gu points out that a distinctive feature of Sinological epistemology is “an insistence on approaching China and its cultural materials in terms of Western models and ways of perception, conception, abstraction, and generalization” (97). This intellectual habit is also characterized by a refusal or reluctance to examine China on its own terms. In Chapter 5, Gu looks at the writings of leading Western and Chinese scholars about China to show the problematic nature of those Sinologistic methodologies. He suggests instead a hermeneutic approach, arguing that only by purging itself of those Sinologistic tendencies can China studies truly become a branch of learning in the international intellectual system. Chapter 6 touches upon a sensitive issue in the field of China studies. Using case studies, Gu convincingly shows that there is a tendency in Sinological circles to divide scholars into groups and to evaluate their work based on their ethnic origin. Gu calls this unhealthy tendency the “ethnicization of scholarship.” Chapter 7 continues his critique of the politicization of scholarship in China-West studies, which is often based on ethnic consciousness, national consciousness, and international consciousness. One example Gu uses is The Xia Shang Zhou Chronology Project, a multi-disciplinary project commissioned by the Chinese government in 1996 to pinpoint the location and time frame of the Xia, Shang, and Zhou dynasties. Nearly 200 specialists in China contributed to this undertaking. The project caused a huge scholarly storm outside China. It was vehemently denounced by US scholars and dismissed as government propaganda to promote nationalism and Chinese hegemony in the world. Chapter 8 focuses on the enduring controversy over the nature of Chinese language, especially writing, to see how phonocentrism and logocentrism in Western metaphysics have evolved into a kind of linguistic unconscious that has dominated studies of the Chinese language in the West. On the one side, we see Fenollosa, Pound, and others who exaggerate the “pictorial nature” of the Chinese written sign. On the opposite side, we see a group of Sinologists following Du Ponceau who would not only deny the ideographic nature of Chinese characters but also go so far as to declare that Chinese is a phonetic system of writing. Gu argues that both sides are oriented by their Western preconceptions and preconceived agendas. As a consequence, both parties have “unwittingly created a linguistic form of Sinologism that distorts the real conditions of Chinese writing, even though their original intention is to offer scientific and objective knowledge about the Chinese language” (210). In sum, readers of Sinologism will come away from the book with many thought-provoking observations and insightful exposures of misperceptions and misrepresentations of Chinese culture in writings about China from both the West and China. Of course, they may also have questions and ideas about further inquiries. For instance, while Gu painstakingly discusses Sinologism in relation to such key terms as Orientalism and postcolonialism, he seems oblivious to other contemporary key terms such as Sinophone and Sinograph. Both terms have played a significant role in the recent development of China-West comparative studies. Furthermore, mainly inspired by Marx’s idea of alienated labor and commodity fetish, Gu defines Sinologism as alienated knowledge in general and an alienation of Sinology and China-West studies in particular (216). In a way, Gu uses the term Sinologism as a blanket term for everything that is wrong with Sinology. But what about what might be right in Sinology? Interestingly enough, almost a decade ago, David Honey wrote a book entitled Incense at the Altar: Pioneering Sinologists and the Development of Classical Philology, in which he treats Sinology as a tradition represented by his heroes such as Edouard Chavannes, Paul Pelliot, James Legge, and Arthur Waley. Honey’s book ends with a resounding declaration: “No one can expect more from the past.” Placing Gu’s book side-by-side with Honey’s, one cannot help but wonder when we might have a third book that presents both the right and wrong sides of Sinology, or the inner logic that makes Sinology what it is.